Debentures will be issued by listed property firms to help raise funds for land purchases totalling more than Bt100 billion this year. A recent survey by The Nation found most of the developers would turn to debentures to help support their business expansion in 2019. The move would also ease their financial burden from an interest-rate increase expected in the coming months. “We plan to issue debentures worth Bt12 billion this year, the proceeds of which will go towards repayments of existing debentures due to expire this year as well as business expansion,” Land and Houses Plc’s managing director Adisorn Thananannarapool said recently. The debenture would maintain its interest rate cost at not over four per cent, he said. Sansiri Plc’s chief financial officer Wanchak Buranasiri said the company would this month issue three-year debentures worth Bt5.5 billion with a 3.8per cent interest rate under the company’s financial plan. It would also provide funds for business expansion this year. A Bank of Thailand (BOT) report showed property firms raised capital by issuing debentures in the first nine months of last year worth Bt172 billion, up 19 per cent from the same period of 2017. Up to Bt100 billion of that total were for debentures of longer than one year, while Bt72 billion were for oneyear debentures that will expire in 2019. Thus, all property firms with debentures expiring this year are expected to issue replacement debentures totalling Bt72 billion. New debentures would then need to be issued to support their business expansion for 2019. “This why property firms will issue additional debentures worth over Bt100 billion this year,” said a bond-market expert. Meanwhile, the Thai Bond Market Association (Thai BMA) said that most property firms will issue new debentures this year to repay the Bt72 billion worth of bonds that will expire this year. They will also issue new debentures to support their business expansion, amid expectation of a rise in interest rate. “Issuing debentures will help developers manage their interestrate costs during a period in which the cost of funds will likely rise ,” Thai BMA said. 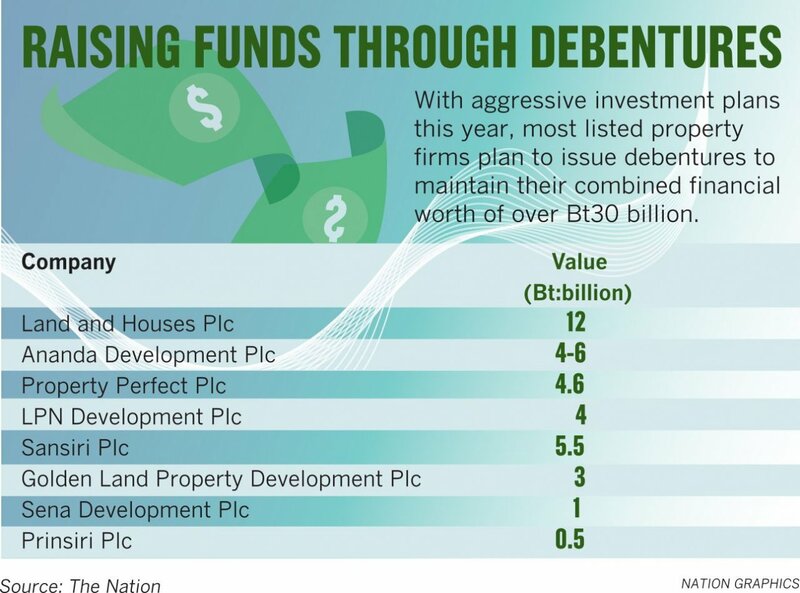 Debentures that will expire this year are worth a total of Bt568 billion, or about 16 per cent of the Bt3.5 trillion market with property firms accounting for up to 20 per cent of that amount, it added.